by telephone at (831) 900-4441, or by an online form at https://hostcompliance.com/tips. 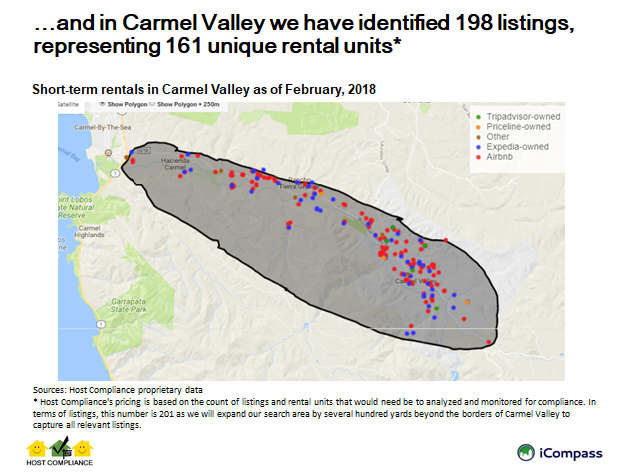 The Carmel Valley Association has provided previous comments on the draft Short-Term Rental Ordinance as it has moved thorough previous workshops. The comments contained in this communication represent the views not only of the Carmel Valley Association, but also a coalition of residents’ associations and individuals from the Carmel Valley, Carmel Highlands, and Mal Paso and Big Sur. CVA has agreed to assume leadership in representing the jointly held views of these associations and organizations and to submit this letter on behalf of the entire coalition (please see signatures below for details on the coalition membership). • Affordable Housing: STRs and HomeStays encourage the conversion of long term rentals to tourist use, and reduces the supply of affordable, decent, safe, long term housing for people of all income levels. Boston, San Francisco, Los Angeles Santa Cruz, Bishop, West Hollywood, and Santa Monica, among others, have passed ordinances limiting STRs to regulated Home Stays because of this undesirable effect. • STRs and Home Stays negate local Zoning Ordinances. Allowing STRs/Home Stays is the practical equivalent of defacto re-zoning residential areas into commercial visitor serving units. Residentially zoned areas traditionally permit non-intrusive business activity. Examples of such permitted activities are home offices, bookkeeping services, and music instruction. Such services are conducted by owners or residents who live on the property, and generally have a minimal impact on neighborhoods. Allowing non-owner occupied STRs and Home Stays, which are, in essence, hotels in residential areas, is inconsistent with residential zonings, and increases the risk of significant disruption of quiet neighborhoods. • Increases Water Use. STRs/Home Stays multiply the numbers of individuals using water, and in turn, overall water use. In an area such as ours with an already inadequate and unsustainable water supply, adding such an additional burden would not be in the interest of Monterey County residents. • Increases Traffic. The Land Use Plans were carefully calibrated to not overburden infrastructure like roads by limiting the number of homes and visitor serving businesses allowed by the Land Use Plan. The explosion of STRs/Home Stays in excess of those limits has created traffic and other serious problems that harms residents and the licensed visitor serving businesses. No absentee owners, property management companies, corporations, LLC’s , or other forms of ownership is permitted. The owner be required to live in and be present on site during the STR/Home Stay rental period. The “Home Stay” version of STR must at all times operate as if it were a residence, and not a hotel, party house, special event location, or other use inconsistent with the zoning in which it is located. Big Sur Land Use Plan/Big Sur Coast Planning Area. It is the position of the Big Sur LCP Defense Committee that these plans have no room for STRs and/or Home Stays. Electronic evidence available over the internet that they physically resided at the STR during the Home Rental. Veriﬁcation to be done by Monterey County. Licenses for STRs/Home Stays are only valid as long as Monterey County provides the personnel and ﬁnancial resources to enforce the ordinance. If Monterey County fails to provide adequate enforcement resources, STR/Home Stay licenses will be suspended until Monterey County remedies by providing required enforcement resources. The County must adopt pro-active enforcement, using Host Compliance or similar service to locate violators, rather than relying on complaints from residents. No advertising of unpermitted rentals, and Host Compliance or equivalent service is required. Permit numbers must be posted in any ads. The total number of Home Stay guests cannot exceed 2 per the number of permitted bedrooms, less one bedroom for the in-residence owner. If the owner resides with their family a suitable number of bedrooms must be set aside for their use. Rentals for more than 30 days or more are permitted but subject to TOT, if rented for 30 day periods, or periods less than a standard one year lease. Owners would be limited to one STR/Home Stay regardless of an interest in other properties the owner may have in Monterey County. Parking at STR’s/Home Stays must be provided off-street for both visitors and residents. Fires must be limited to existing barbecue pits and ﬁreplaces. STR’s/Home Stays must be spaced at least 1000 feet from each other, and notice of intent by the Planning Commission to permit an STR/Home Stay must be given to all neighbors within a 1,000 foot radius prior to issuance of the permit. If a neighbor objects, a hearing must be scheduled and the objections considered before a permit is issued. As a condition of approving any application for a STR/Home Stay the applicant must provide a letter from the water supplier to that location that there is sufficient water for the maximum possible use of the property; and, the Department responsible for leach field safety states the leach field is adequately sized and properly maintained for the maximum possible use of the property. STR/Home Stays must be completely subject to the rules and restrictions of private roads, and may be banned along such roads. The remedies provided by this [ordinance] are cumulative and in addition to any other remedies available at law or in equity. It shall be unlawful for any person to violate any provision, or to fail to comply with any of the requirements, of this Chapter. Any person violating any of the provisions or failing to comply with any of the mandatory requirements of this Chapter shall be guilty of an infraction. No proof of knowledge, intent, or other mental state is required to establish a violation. Any condition caused or allowed to exist in violation of any of the provisions of this Chapter shall be deemed a public nuisance and shall, at the discretion of County, create a cause of action for penalty pursuant to Chapters 1.22 of this Code, and any other action authorized by law. Each and every violation of this Chapter shall constitute a separate violation and shall be subject to all remedies and enforcement measures authorized by the Monterey County Code or otherwise authorized by law. Additionally, as a public nuisance, any violation of this Chapter shall be subject to injunctive relief, disgorgement of any payment to the County of any and all monies unlawfully obtained, costs of abatement, costs of restoration, costs of investigation, attorney fees, and any other relief or remedy available at law or in equity. The County may also pursue any and all remedies and actions available and applicable under state and local laws for any violations committed by the STR/Home Stay rental activity or persons related thereto, or associated with, the STR/Home Stay rental activity. A ﬁne not exceeding eight-hundred percent (800%) of the Advertised Rental Rate per day per violation or ﬁve thousand dollars ($5000.00) per day per violation for STR/Home Stay rentals without an Advertised Rental Rate for each additional violation of the same ordinance within one year of the ﬁrst violation. The Carmel Valley Association prevailed on the California Environmental Quality Act (CEQA) issues raised. The court found that the EIR prepared for the Rancho Cañada Village Project failed to provide an accurate project description and that the EIR's alternatives analysis failed to satisfy CEQA. The court also found that the County of Monterey's failure to timely amend the Inclusionary Housing Ordinance constituted an abuse of discretion. The County had failed to amend the ordinance consistent with the General Plan's requirement that 25% of new housing units be affordable. The court held that the County's decision to exempt the Project from the distribution of affordable housing units across very low, low, moderate, and workforce incomes was unsupported by substantial evidence. With respect to the Project's calculation of affordable units for the Project, the court found it reasonable for the County calculate the number of affordable units for the Project based only on number of new lots created. The court did not find in favor of the Petitioner regarding the County's failure to implement the Development Evaluation System (DES) within 12 months of adopting the 2010 General Plan. Therefore, the court denied the Petitioner's request compelling the County to develop and promulgate the DES. On December 13, 2016, Supervisors Potter, Phillips, Armenta and Salinas had voted to approve the subdivision. CVA filed the litigation in January 2017. CVA’s major concern is that established land use decision-making practices and legal requirements were ignored in a rush to act on the project before 2017. This rush to judgement by the Board of Supervisors in late December set a dangerous precedent for the approval process for all future projects in the county, and there is already another major project in the pipe-line for Carmel Valley that has similar flaws. While the County’s General Plan governs land use decisions, the Board ignored at least six important General Plan policies. These policies relate to the way the General Plan is to be amended, traffic policies intended to ensure our safety and prevent further degradation of our roads and highways, and affordable housing requirements. Projects that are inconsistent with substantive General Plan policies cannot legally be approved under California laws. Failure to meet significant requirements of the California Environmental Quality Act is also at issue. These include a lack of a proper project description, flawed analysis of project alternatives, as well as an inadequate assessment of traffic impacts. Had the project been processed in accordance with existing General Plan policies, an amendment to the General Plan’s affordable housing requirements should have been considered separately from the proposed project. This would have given the public and decision-makers an opportunity to weigh-in on this important issue. Additionally, due to the haste in getting the project to hearing, the Planning Commission did not have a Final EIR to review, nor did it have a complete list of project conditions, until the day of the hearing. In spite of its responsibility to provide the Board of Supervisors with a carefully considered recommendation, and over the protests of Commissioners Diehl and Vandevere, the Commission sent the project to the Board with little or no discussion. Likewise, final Board deliberations were equally sparse and inadequate. In short, the approval process for this project was not conducted pursuant to legal requirements, and that it did not properly serve the interests of the people of Carmel Valley. It set an egregious precedent that we could not allow to stand. On July 7th, 2017, Attorneys William Parkin and Yuchih Pearl Kan filed an opening brief on CVA's behalf, detailing the grounds of our lawsuit, which was heard by Judge Lydia M. Villareal on February 2nd, 2018. Environmental review is integral to the land use decision-making process. Environmental Impact Reports (EIRs) are required when a project has the potential of having a significant impact on the environment and mitigation measures are not readily available so that a Mitigated Negative Declaration can be prepared. Many sections of an EIR require technical expertise to evaluate such as traffic, air quality and biological resource impacts. However, there are many sections of an EIR that non-experts can address. LandWatch board member, and CVA advisor. Carmel Valley Road, like other roads, is divided into segments, usually just a few miles long, for measurement purposes. Direct measurement of traffic volume consists of counting of vehicles traveling past a specified point on a road segment during a fixed period of time. The actual counts typically are recorded every fifteen minutes for several days (e.g., a week), on an automatic device. Each day’s record is made available in a readable format for analysis. Thus the fundamental measurement unit is vehicles per quarter-hour, but this is converted to vehicles per hour or vehicles per day for purposes of analysis and assessment. Carmel Valley Road has both two-lane and four-lane segments, but because the four-lane traffic capacities considerably exceed the existing traffic volumes, attention is focused on the two-lane segments. in the Carmel Valley Master Plan area there are seven two-lane segments of Carmel Valley Road (identified as segments 1-7), all lying between the eastern edge of Carmel Valley Village and Via Petra (just west of Rancho San Carlos Road). In addition the segment of Highway 1 between Carmel Valley Road is critical to understanding Carmel Valley Road traffic because (1) the west-bound lanes of Carmel Valley Road are contiguous with the northbound Highway 1 lanes, there being no exit or entrance to those lanes at their intersection, and (2) southbound Highway 1 consists of a single lane that is highly congested during peak traffic times, and 2/3 of its traffic enters Carmel Valley Road so that most traffic entering Carmel Valley Road must pass through that excessively congested lane, on which traffic volume exceeds the lane’s capacity. Two separate criteria are used to evaluate traffic service quality on two-lane roadways like most of Carmel Valley Road. Both criteria depend on traffic counts as raw data. “Average daily trips” is simply the total volume of vehicle flow in 24 hours -- the number of vehicles per day. Each two-lane segment of Carmel Valley Road is assigned a “threshold”, or acceptable level of traffic volume, by the County. “Percent time spend following” (defined as the proportion of time during which the separation between vehicles is less than three seconds, when measured at a point along the road and at a time of peak traffic) is not really measureable in practice. In place of actual observation of the relevant percentage of time, a mathematical model (known as an exponential probability distribution) is used as a surrogate. During an hour when traffic is at its peak, the numbers of vehicles passing in each direction are observed, and the numbers are converted, through a complicated formula, into a number between zero and 100 that is presumed to represent the probability (in %) that an arbitrary vehicle would pass a fixed location less than 3 seconds after the vehicle preceding it. Thus the traffic measurement is of vehicles passing per hour, but the numerical assessment is a percentage; the formula represents the growth of traffic intensity as decreasing when the actual volume of traffic increases. Assessment of the critical segment of Highway 1 between Ocean Avenue and Carmel Valley Road normally has been achieved through application of PTSF (described above) to the congested single southbound lane. However, a method called “multimode level of service”, or MMLOS, has recently, and totally inappropriately, used by the County to evaluate Highway 1 traffic for projects in the Carmel Valley Master Plan Area. 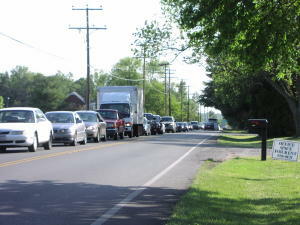 This method does not even consider traffic volume measurements to evaluate traffic levels; instead it uses two roadway characteristics, the number of enforced stops per mile and the proportion of left-turn pockets as traffic criteria. Thus the County’s assessments are completely independent of the numbers of vehicles using the road! Furthermore, Highway 1 does not meet the basic requirements for applying the method! Use of MMLOS on Highway 1 is entirely fraudulent. Nevertheless, the County has used this inapplicable scheme in project EIRs (the current Rancho Canada Village [project approved but in litigation initiated by CVA] and Val Verde Rd. projects), despite CVA’s explicit and adamant objections. Time periods for analysis: ADT – 24 hours; PTSF and MMLOS – 1 hour during peak traffic. County traffic impact criteria are applied in two ways simultaneously on two-lane Carmel Valley Road. The term “threshold” can be used in both. For the older ADT method, “threshold” refers to a specific volume (count) of vehicle trips per day, different for each road segment, published first for the Carmel Valley Master Plan (CVMP) in about 1991. For PTSF, which appears for the first time in the 2010 CVMP, the numbers of vehicle trips per hour at peak traffic times are, as indicated above, converted to percentages (PTSF values), and then the resulting percentage is assigned a letter grade (A-F, as in school grades) called “level of service” or LOS, with the boundary between D and E (i.e., at PTSF = 85%) being the “threshold” of environmental significance. In Carmel Valley, both ADT and PTSF thresholds must be respected (with ADT below the CVMP specification, and PTSF below LOS E), with failure to fall below threshold resulting in a public hearing before the Board of Supervisors. LOS grades also are used in MMLOS assessments, but this is actually irrelevant; as indicated above, the use of MMLOS on Highway 1 is fraudulent. (This is readily demonstrable, and is discussed and explained in considerable detail in CVA comments to the County on the Rancho Canada and Via Verde EIRs.) The County has given, to the segment of Highway 1 most relevant to Carmel Valley concerns, an outrageous and indefensible LOS grade of “LOS C”, based on its MMLOS “analysis”. Among other things, the MMLOS “analysis” depends only on a pair of the roadway’s design characteristics, and not at all on the volume of traffic! All other assessments of that segment for many years have been LOS F, i.e., traffic exceeds the capacity of the road segment. The pre-MMLOS evaluations have been based on PTSF analyses of the single southbound lane. LOS F means traffic exceeds road capacity; not even one vehicle trip is to be added during peak hour. 7. Schulte to Rancho San Carlos. Segments 3, 4, 6 and 7 were the principal subject of the CVA statement. These are the heart of Carmel Valley Road, and play a major role in the Master Plan and its history. Roughly 35 years ago a number of foresighted and determined Valley residents (members of the original CVA), in order to protect the Valley’s rural character, composed a master plan covering the area from the eastern edge of the Village to Highway 1, ridge to ridge. With the aim of preventing suburban- and urban-style traffic congestion, the master plan created a process for establishing traffic standards on CVR. By 1991 a firm set of standards was in place, and the CVMP requirement that CVR traffic levels be monitored and reported annually was fully implemented. Last week’s Bulletin responded to the most recent of these County monitoring reports. What we often want to know from the reports is, “How much more traffic can CVR tolerate until Environmental Impact Reports must show significant environmental impacts?” For a variety of reasons there is no simple and fixed answer, but we can make reasonable rough estimates based on existing policies and data. Our initial challenge is to insure that existing policies are interpreted fairly and are fully enforced, and that real data is respected. Toward that end we examine relevant parts of the 2014 report. In the table that follows, the first three columns are the same as those in the previous CVA Weekly Bulletin, and the fourth column shows the number of vehicle trips per day that, if added, would cause the segment’s traffic to exceed its threshold of acceptability or of significant environmental impact. The final two columns show the relevant thresholds themselves as published in the Carmel Valley Master Plan, and the measurements of 2014 daily traffic volumes. The first four rows represent data collected in June of 2014 on relevant CVR segments (3,4,6,7), and the final four rows are for October on the same segments; the only segments considered relevant are those that have a reasonable likelihood of undergoing significant environmental impacts from potential new development. The boldface underlined numbers in the table are the smaller values of “trips below threshold” for each segment; these are the additional traffic volumes allowed before the impacts are considered environmentally significant. Thus segment 3 would tolerate 101 new trips per day, segment 4 would tolerate 168, 5 would tolerate 818, and 7 would tolerate 210. Typically a residential unit adds about 10 trips per day, so dividing by 10 gives the approximate number of residential units contributing directly to each segment; therefore the tolerable number of new residential units contributing traffic would be about 10 for segment 3, about 17 for segment 4, about 82 for segment 6 and about 21 for segment 7. Since any new units generating traffic on Carmel Valley Road would contribute their traffic to several segments, the smaller tolerances are the more relevant ones; a good guess probably is that roughly 20 new residential units, or the equivalent, would formally yield a permanent adverse environmental impact on the two-lane portion of Carmel Valley Road. Another, more complex, type of measurement called “percent time spent following” (PTSF) also is monitored and reported. It shows that segments 6 and 7 already have significant adverse environmental impacts from traffic imposed earlier. The threshold of significance for these segments is a PTSF of 85.0 on a sale of 100, and segments 6 and 7 have PTSF values of 86.0 and 89.3 respectively. By this measure, there is no available tolerance for additional traffic volume on segments 6 and 7 according to the CVMP. Carmel Valley residents must now decide how they will respond to these circumstances in order to sustain the rural character of Carmel Valley Road and of the Valley itself, and they must now make their determination known to County decision makers. The CVMP is not self-enforcing! On Wednesday, March 12, the Monterey County Planning Commission unanimously accepted CVA's arguments that the County should prepare an initial study to look at the impacts of the proposed equestrian center at Carmel Valley Ranch. The commissioners asked good questions -- what is there now, what is proposed, what would happen in the future in light of the approved 12-lot subdivision. County staff was not able to answer some important questions, and gave conflicting responses to others. The commission rejected the staff's recommendation to approve the project on a California Environmental Quality Act (CEQA) exemption. Molly Erickson represented CVA as counsel, and President Pris Walton and board member Eric Sand spoke in support of CVA's position. Molly and Pris had sent in correspondence prior to the commission meeting. Board member Rick Manning also attended. (Carmel Valley Ranch was represented by attorney Tony Lombardo and general manager Simon Snellgrove.) The commission's action is consistent with the Land Use Advisory Committee's unanimous concerns about the project. Next step: the County will prepare an initial study that is based on Appendix G of the CEQA guidelines. Foothill Partners is proposing to build a commercial retail development on approximately 3.8 acres of land located at 3705 Rio Road within the County of Monterey's Carmel Valley Master Plan Area in unincorporated Monterey County, California. The retail development would consist of four commercial retail buildings, including a maximum 23,000 square foot convenience market/grocery store and three smaller buildings ranging from approximately 5,000 to 8,335 square feet. The development would additionally include two commercial retail farm sheds of 250 square foot each. In total, the project would involve the construction of 42,310 square feet of commercial space, and the building footprint of all buildings would occupy 26 percent of the 164,421-square foot site. In June, CVA met with the partners of the Clear Peak Group, developers of September Ranch. The Group's purchase comes with a tentative map and well permit, as well as 190 conditions for the 891 acre property. Planned is a Tehama style project with 73 residential lots, sized at 2-4 acres and priced at $1-1.5 million. The project also calls for 22 affordable housing units (15 inclusionary and 7 deed-restricted workforce housing). The equestrian center fronting Carmel Valley Road will remain in place. We emphasized CVA's strong support for building affordable housing in the the valley. Also, toward our persuasions, both developers are experienced with sustainable projects and, in part because of new California building standards, plan to require extensive solar and water conservation measures in the homes. The acquisition of the former Rancho Cañada golf course for protection by the Monterey Peninsula Regional Park District securess water for wildlife, helps prevent flooding, and provides new opportunities for recreation. The land, which includes a mile of river frontage, absorbs water when the river runs high, protecting downstream neighborhoods from flooding. It is home to numerous threatened and endangered species, including steelhead, red-legged frogs, and tri-colored blackbirds. And it is part of a network of protected land stretching south 150 miles from Carmel to San Luis Obispo. The Monterey Peninsula Regional Park District has moved its headquarters to the former golf course and oversees its restoration. A network of trails provides access to the river and connects to the parklands accross the river. The district and the local Santa Lucia Conservancy plan an outdoor classroom and environmental education programs for visitors and school groups. Also important for the water-starved Monterey Peninsula, public ownership allows water formerly used for irrigation is returned to the river, protecting native steelhead by stabilizing flows downstream. The existing clubhouse serves as Palo Corona’s and the district’s headquarters, provides offices for like-minded non-profits, space that can serve as an command center during fire and flood emergencies, banquet rooms to host events like weddings, and meeting space for our community’s civic organizations. The back country parcel appeared unchanged, with existing trials and some added camping opportunities. MPRPD recently received, signed, and submitted the financial grant-related agreements to the respective State agencies that generously awarded us funding for the acquisition of the Rancho Cañada property. 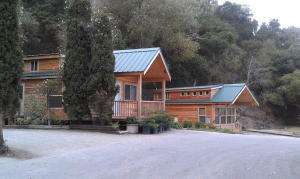 Each grant's purpose and intent includes: acquiring the Rancho Cañada property; substantially reclaiming, restoring and sustaining the site as native habitat; and providing compatible environmental education and passive recreation opportunities that minimize or eliminate potential negative impacts to the site's soils, plants, animals, and water features. A key goal with respect to this property's acquisition is to reintroduce common, threatened, and endangered native flora and fauna. Several uses that have been explored are unfortunately incompatible with the property's and grants' intended purposes. Activities that may inevitably or unavoidably result in the repeated trampling of restored habitat, and/or disturbance of extant and reintroduced native flora and fauna will not be allowed. To further this goal, MPRPD is carefully identifying trail corridors geared to keeping people on-trail. On Tuesday October 27th, 2015, the Monterey County Board of Supervisors voted unanimously to overturn the earlier decision of the Monterey County Planning Commission, refused to certify and approve the EIR for the proposed Carmel Canine Sports Center in the Quail neighborhood. On an appeal of the Planning Commission's decision brought by Friends of Quail and Quail Lodge and supported by CVA, the Board of Supervisors voted 5 to 0 to uphold the appeal and reject the project entitlements. We want to thank the Monterey Country Board of Supervisors for making the right choice, and for being responsive to the clear opposition expressed by the overwhelming majority of those Carmel Valley residents who spoke on the issue. This win came only because we all worked together as a community on behalf of our shared vision for Carmel Valley. The vacant field on the west side of the middle school, previously proposed for affordable housing, has been purchased by the Carmel Unified School District. We understand that atheletic fields are proposed for the property. There is a partially completed flood control trench on the east side of the property, which was intended to drain flood waters comming downfrom the Rio Vista into the river, preventing flooding of properties to the south of Carmel Valley Road. Flooding from Rio Vista in the mid '90s caused severe damage to properties along Rio Road, including the Crossroads and Mission Fields. On July 26, 2017, the planning commission voted 7-0, to overturn the administrative interpretation that allowed Hilltop Ranch to have marketing events on site. Hilltop appealed to the Montery County Board of Supervisors, and on November 14, 2017, after testimony from CVA and neighbors, the supervisors upheld the Planning Commission's decision, voting 4-1. Commissioners Keith Vandevere and Martha Diehl were spot on, as usual, with their questions and comments. Commissioner Vandevere made the motion to overturn the administrator's ruling. We should be very grateful that Supervisor Adams has kept them in these positions. They are terrific representatives for District 5. In addition to lawyers Molly Erickson (for CVA) and Anthony Lombardo (for neighbors near Hilltop), about 20 people showed up to speak in favor of overturning the decision. Richard Rosenthal, also an area land use lawyer, came and spoke as well. Another key argument was that this interpretation essentially applies to anyone with a vineyard on their property anywhere in the unincorporated County. You too could have weddings nearby if you live near someone's vineyard. It was a good opportunity to educate the commissioners on how these venues affect the neighbors and how often they get out of hand. The General Plan, in which CVA was integrally involved, provids three specific zoning laws that directly fly in the face of what Hilltop wants to do and is already doing in a residential neighborhood. Another influencing fact was that this "interpretation" would allow anyone with a vineyard in the whole of the unincorporated county to have "events" in Low Density Residential zones. On July 11, the Superior Court heard oral arguments on the county's demurrer and motion to strike Hilltop Ranch’s amended petition. The court sustained the county's demurrer with leave to amend. This means Hilltop Ranch got another opportunity to attempt to frame its legal claims in a new amended document. In August, Hilltop Ranch filed a third version of its initial pleading with the court. In it Hilltop Ranch again argues that the county planning director’s “interpretation” became final for all purposes ten days after it was issued – even though the planning director gave it only to Hilltop Ranch, and not to anybody else. Reversal of the County Supervisors’ ruling, and the precedent set by it, would have an extremely negative impact on our valley! What is the property that is the subject of the CVA appeal? Hilltop Ranch LLC owns residential property in Carmel Valley in the Low Density Residential (LDR) zoning district. 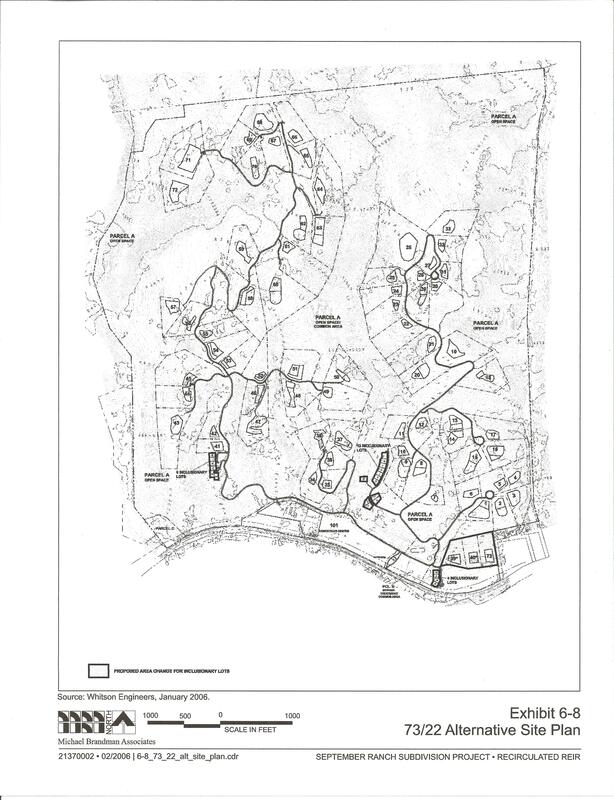 Hilltop Ranch made three applications in 2013, 2014 and 2016 seeking to get County permission to have special events at its vineyard, which apparently was planted in the early 2000s and is approximately three acres of the 10-acre LDR-zoned property. Each of the special events applications has been met with substantial opposition from the neighbors, CVA and the Carmel Valley Land Use Advisory Committee. The County has not approved any permits for the special event use. What does the CVA appeal challenge? Carl Holm wrote three communications to the Hilltop Ranch LLC's attorney in which Mr. Holm stated his opinion based on his "interpretations" that Hilltop Ranch can have special events. The three documents are an email dated February 11, 2016, a letter dated April 11, 2017, and a letter dated May 16, 2017, which CVA collectively refers to as "the Holm Letter." CVA has appealed the Holm Letter. What is the harm caused by the Holm Letter? The Holm Letter used a private process to allow special events uses every day of the year at the Hilltop Ranch site in the residential district. The public process was not followed. Other than the applicant, nobody got any advance notice of these three documents. The Holm Letter rewards the applicant for private lobbying and private meetings with Mr. Holm. Surrounding residences and property owners who based their land uses on the Low Density Residential zoning and not on a private deal they did not even know was available to them from Mr. Holm. They will permanently suffer the noise, traffic, glare, and other impacts of the special events. Competitors in the Ag Wine Corridor Plan area in the Salinas Valley who have General Plan policies that allow special event uses. Venues that have permits for their special events activities. Everybody who drives Carmel Valley Road and is forced to endure the increased special events traffic. Is the Holm Letter illegal? Yes. It allows special events in a residential district where special events uses are not allowed by the zoning. It gives special uses for select private parties favored by Mr. Holm. It violates state laws and the County Code. It provides an incentive for everybody in the Low Density Residential (LDR) zone to plant a vineyard so they can have special events. It corrupts the public process. If allowed to stand, the Holm Letter will cause serious long term land use and environmental effects and will harm the public's trust in Monterey County government. In December 2018, the developer applied for a new 41 unit project. We understand that it will include the original parcels on the west side of Val Verde Drive and land on the east side which previously belonged to the Carmel Presbetyrian Church. The project has been assigned to county planner Craig Smith and assigned file number PLN180559. Details to follow as they become available. Expressing concern about the proposed development's non-compliance with County Development Evaluation System's affordable housing requirements, the planners voted 8 - 1 to deny the project and canceled a second scheduled hearing. We understand that the developer is considering an alternative proposal for the property. CVA testified before the Planning Commission concerning the projects inconsistencies with the General Plan and submitted a 14-page letter outlining the defects of the project and the inconsistencies in the Final Environmental Impact Report. The project doesn't meet the affordable housing requirements of the Carmel Valley Master Plan and the County General Plan. The project exceeds the number of units allowed in Carmel Valley under the legal settlement agreed to by CVA and the County. The completed project would add over 300 daily trips to already over capacity Highway One. Thirty one families would be added to a high risk flooding area. The installation of a 6 foot flood wall would add risk to downstream residents and businesses. There is no guarantee that the residents of the 31 units would not exceed the water demand assumed by the EIR. The project would adversely impact the rural nature of the Carmel Valley. It will turn its existing rural character as an agricultural production site into an urban site. Keeping the site in agricultural production would adhere to CV Master Plan Policy CV-1.1 which would maintain the agricultural character of the area. 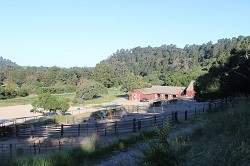 These lands are currently used by local organic farms and serve and maintain the rural character of the Carmel Valley. Converting these plots of land into 31 units does not maintain the rural character of the Carmel Valley. The project designation is Carmel Rio Road Subdivision (PLN140089). The underlying bedrock is a massive sandstone and pebble conglomerate in which the weathered residal soils liquefied." Of course, neighbors are concerned. The owner intends to provide reasonably priced rental options for families who visit the area. The 400 square foot Park Models include kitchenettes as well as running water. 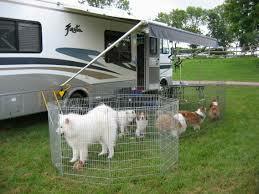 The RV Park has its own wells. The Bay Laurel (Bernardus Lodge) extension application came to Public Hearing April 13, 2013. It allows development of 16 approved additional hotel units and a 3,000 square foot maintenance building. It was never referred to LUAC for review. The permit was found to be consistent with the Carmel Valley Master plan. Based on the Annual Summary of "Carmel Valley Master Plan Visitor Accommodation Units." The 16 rooms had not been built at the time of the adoption of the 2010 General Plan and county said they would be subtracted from the 110 unit cap. The Planning Dept says the project is consistent because the units can be included in the 110 unit cap. Although not within the Carmel Valley Master Plan, the proposal from State Parks for Odello West, River and Monastery Beaches, Pt Lobos Ranch, and Bay School will affect our valley's eco-system and traffic. The proposal includes reducing parking at Pt. Lobos and along Highway one, adding parking at Bay School, Pt. Lobos Ranch and Odello, and boating and bike rentals. Soon after Labor Day 2015 residents of the Los Tulares neighborhood suddenly noticed the emergence of a superhighway of airplane traffic flying over Carmel Valley. They discovered that it was principally commercial aircraft originating from LAX and flying to SFO. 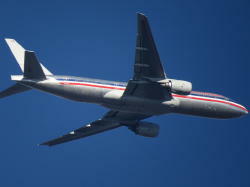 This increased aircraft noise results from the new FAA Star arrival route. Many families who bought homes in wilderness areas are now inundated with the constant roar of a freeway in the sky from morning until late at night. Linda and Richard Cheatham have created "Save Our Skies Monterey County" and are closely working with "Save Our Skies Santa Cruz." CVA has concerns about the barrier's visual impact, its impacts on the wastewater plant, and its intrusion onto state park land. continue to monitor proposals affecting our valley. Below are links to information concerning our river and water supply. the Carmel River Watershed Conservancy. 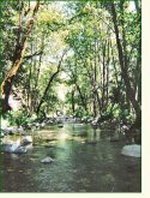 A nonprofit organization dedicated to the protection and restoration of the Carmel River. Water conservation design codes added to California Plumbing Code.